Now I have to admit I'm a sucker for a pretty blush palette. I absolutely love my new Hourglass ambient lighting edit palette and every time NARs bring out a new limited edition palette, my bank balance usually goes down! So, I though it was about time we saw what the high street had to offer. I picked up the Makeup revolution Ultra blush palette in Hot Spice. This palette is stocked in Superdrug and online for £6. Currently on 3 for 2 so it could work out even cheaper! There are 8 shades- all a good size so you don't have to be too careful when swirling your brush around in the palette. There are 3 slightly shimmery shades, 3 matte and 2 highlighter/ pearlescent shades. The packaging is black plastic (what you expect from drugstore) but it is quite slim and has a big mirror that fills the lid. I have to say that I am quite impressed with this palette, the colour pay off was better than I expected, I also like that every single shade is wearable with a good mixture of finishes. If you are just starting out in makeup I would thoroughly recommend this one- a great stocking filler too for those makeup addicts! Obviously, this is not going to beat NARs or Hourglass in terms of pigmentation but with the value for money aspect, I really do like this palette and will definitely be using it myself. Now this palette is an all rounder as it contains 2 highlighting shades, 3 blushers and 3 bronzing shades. 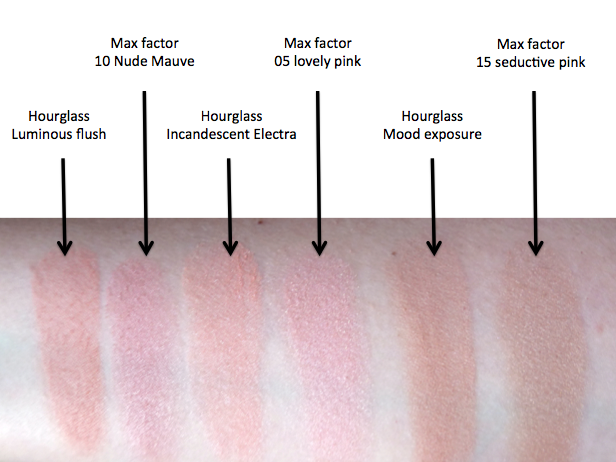 To look at, this palette looks like the blushes are baked with a lovely swirl effect running through them but once you have used these a couple of times, this effects fades unfortunately. I do like the 2 blushes on the left and the matte bronzers but the colour pay off from this palette is disappointing compared to the makeup revolution one. The right side of the pan is far too glittery and chunky to wear as a blush. This is again £6 from superdrug in very similar packaging. There is definitely a clear winner for me but I don't think they will beat the Maxfactor creme puff blushes as these are the closest dupe I have found to the Hourglass baked blushes. Saying this, I really do like the makeup revolution palette as it is such good value for money.